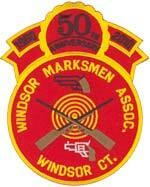 Welcome to the online home of the Windsor Marksmen’s Association, Inc. Check the menu for information on Club news, events and match schedules. This organization has been in existence since early 1960. The Windsor Marksmen’s Association was established by a few local sportsmen for the purpose of organizing and establishing a recreational firearms shooting organization. The club had an initial membership of about 20 members but has since grown to a membership of more than 200 members without regard to race, creed, ethnic background, gender or shooting ability. The regular membership meeting is held on the first Friday of every month at the Hayden Station Fire House on Pond Road in Windsor, Connecticut. Our shooting programs have been very diversified consisting of Bullseye target matches, Bowling Pin matches, Trap, NRA Rapid Fire matches, Archery target shooting. We also have a few matches where the firearm of choice is the muzzle loaded black powder firearm. So therefore we have something for everyone, no matter what their shooting interests might be. Our range facilities in Windsor consists of a 10 point firing line at a 100 yards and a 10 point firing line for 50 yards. The range is located in quiet peaceful settings adjacent to the Connecticut River.